1. 25 inch wide poly solids web belt. 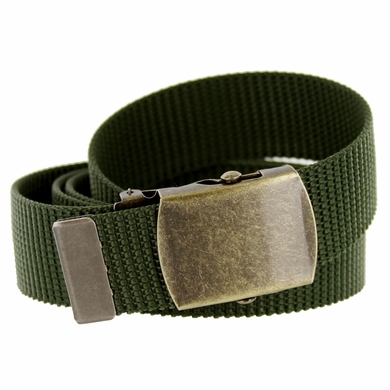 The clamp-on buckle is created with an antique brass color finish. The end of the belt features a matching metal end cap. The vintage style looks great with jeans, shorts, uniforms and more. Size is adjustable up to 44 inches. This cut to fit belt can be shortened by prying off the buckle and using a scissors to trim down the length to a size that works best for you. When done replace the buckle and you have a perfect fitting belt. Also great for Teens & Young Adults.